The Bahmani Kingdom was a Muslim State in Deccan; it was the first independent Islamic kingdom of southern India. This kingdom was established by Ala-ud-din Bahman Shah after revolting against the Delhi Sultanate of Muhammad bin Tughluq. This coin was minted by Ghiyath Al-Din Tahmatan Shah (AH799; AD 1397), he was the sultan of Bahmani Kingdom. Ghiyath Al-Din Tahmantan Shah Succeeded Muhammad Shah II. He issued coins in silver and coppermetals. Both of his coins silver tanka and copper fulus are rare. Silver tankas were minted in Hadrat Ahsanabad mint. Copper fulus are similar to Muhammad Shah II in terms of weight and style. This rare copper falus issued by him weighs around 5.15g. 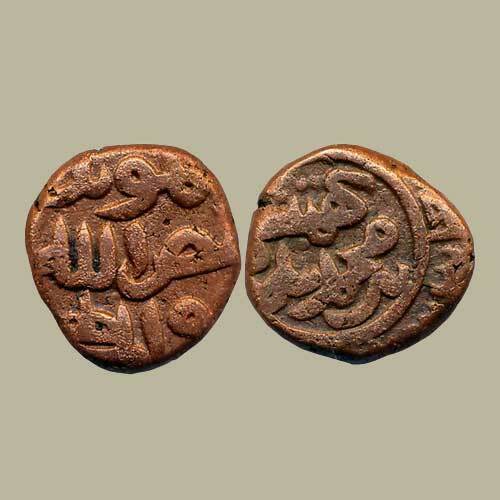 The obverse of this coin a legend is inscribed, which reads ‘Al-Musayyad Bi-Nasr Allah Abul Muzaffar’. The reverse of this coin depicts an inscription, it reads as ‘Tahmatan Shah Bin Muhammad Shah’.